The controversial bitcoin cash fork just got some bad news. 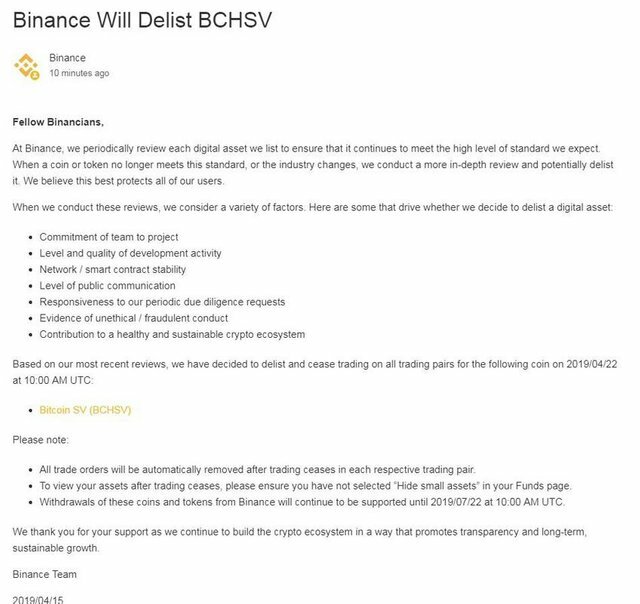 Binance, the world's largest and most popular cryptocurrency exchange announced that they will be delisting BCHSV. BCHSV is also known as Bitcoin (Cash) Satoshi's Vision. It was the controversial hard fork of bitcoin cash late last year, that may have contributed to bitcoin core crashing from $6k down to about $3k in a matter of days. There has been a major feud going on between Craig Wright (said liar) and pretty much every other person in crypto. That spilled over to feuding with the CEO of Binance, who finally said enough is enough. We will no longer list your $hitcoin. I can't believe BCHSV has as much value as it does. It should be worthless in my opinion. Craig Wright is 100% not Satoshi and he never was. He likely was around when Bitcoin was created but he was not the person that wrote under the pen name Satoshi and he does not have access to the Satoshi wallet. That was likely Dave Kleiman. Anyways, the delisting couldn't have happened to a nicer guy in my opinion and I hope other exchanges follow suit. Does this mean you are happy it got delisted? Wow, what a scam that turned out to be! Glad I sold all mine the first day or so! I hope it goes to zero. Oh it probably will! Wonder what the best way to short that thing? Lol Buy some putts on it or something?? Can you? If you find a place you can short it or buy puts let me know. Just need all the other major exchanges to follow suit! I have already guessed that there would be some big conflicts between big coin companies and markets. I also estimate more conflicts will happen in the next bull run which was started. Thank you for this valuable post. Yep, I think you are right. Anything that is mostly controlled by one person will have issues. This is the hot topic of today! Yep, hopefully other exchanges get on board with this. I do hate bsv and the whole controversy around it. But also Binance is showing how centralized they are by doing this. Kind of torn on this one. I second that bunch of jokers glad to see Binance doing the right thing. Me too. Hopefully other exchanges follow suit! Good riddance to it! When BCH was at $130 each, I knew it was time to buy. I just didn't have extra cash at the time, and my hard fast rule is to never buy crypto with debt/credit. Maybe some that money will flow into bch or bitcoin as it leaves bchsv. The way it started was not right. Eventually something will happen when you attack the very entity that keep You rolling. 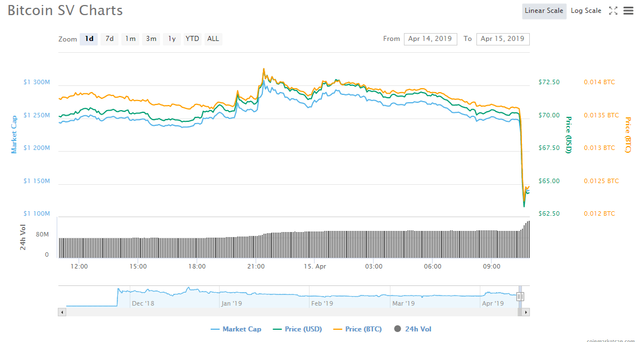 Most likely it will keep going down and other exchanges will delist. This will bring major liquidity issues for the coin and may spell trouble for the longer term view. However, these purges need to happen for the healthy of the overall cryptocurrency ecosystem. Agreed. Would love to see that money flow into bitcoin. Kraken is delisting #BitcoinSV as well. !! !